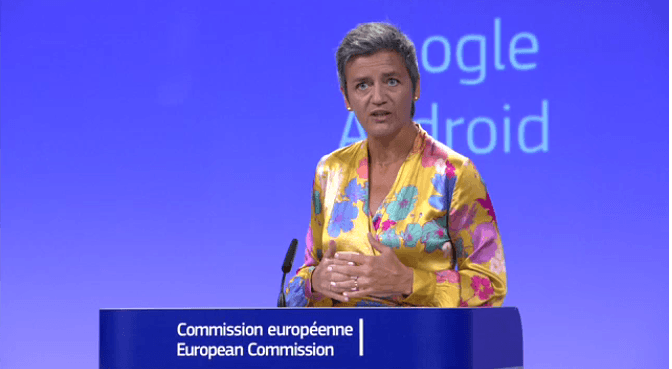 Margrethe Vestager, EU‘s Competition Commissioner, just confirmed that the EU‘s antitrust investigation into Google AdSense will soon be wrapped up. “We are approaching the end of that investigation,” Vestager told reporters at Web Summit in Lisbon, according to Reuters. The investigation’s findings have been greatly awaited as it could lead to Alphabet — Google’s parent company — receiving another historical fine. The EU slapped the company with a €2.4 billion fine for demoting competing shopping services in searches and a record-breaking €4.34 billion fine for illegal restrictions on the use of Android. The investigation into AdSense, just like the first two cases, is to determine whether Google abused its dominant market position to stifle competition. Google denies all charges, but Vestager and the EU believe the company prevented third parties from using its advertising tool to display search ads from Google’s competitors. Vestager has led the charge against tech behemoths and is easily one of the more recognizable politicians in the tech sphere. She’s been extremely vocal about the need for tech to serve people, and how illegal competition by the likes of Google smothers tech innovation. As it looks now, the AdSense case will be the final chapter of the EU‘s long struggle to tame the tech giant — and it’s likely to be a dramatic one judging by the previous fines. However, it’s unlikely the EU will stop there as Vestager, the driving force behind the probes into big tech, is likely to seek to stay on as Competition Commissioner for another five-year term.